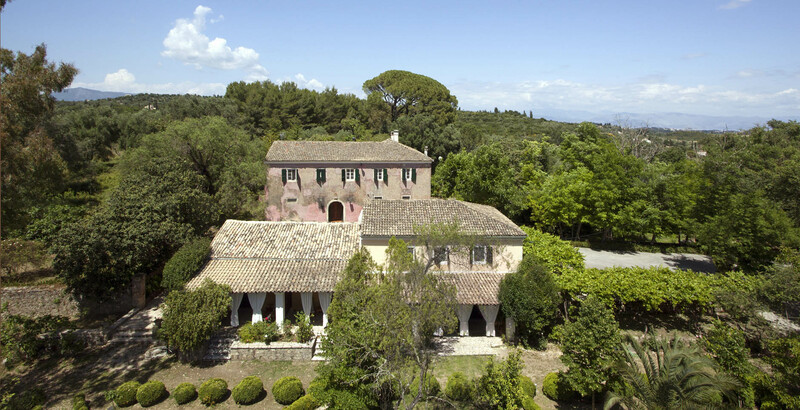 An 18th century olive farming family estate on the island of Corfu, turned into an elegant hotel with luxurious accommodation, antique furniture, vast gardens, a tennis court and a great swimming pool. 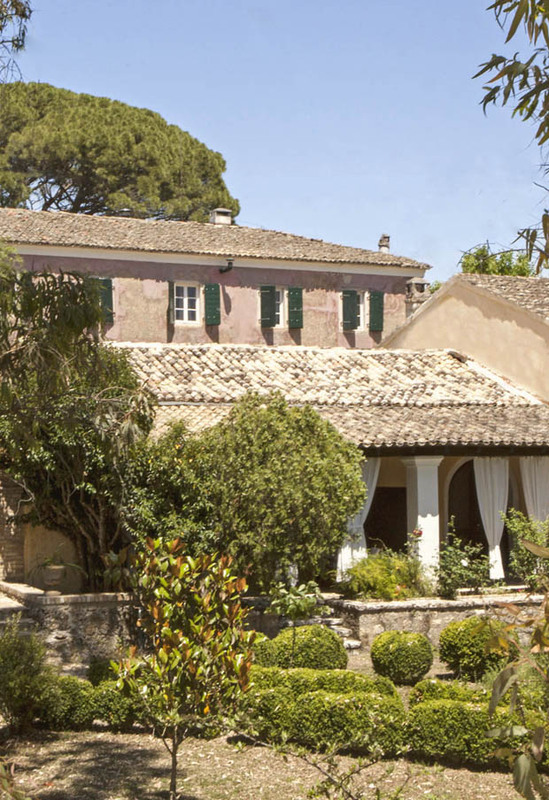 The Pelecas Country Club on Corfu is a magnificent 200-year-old family estate of 56 acres. 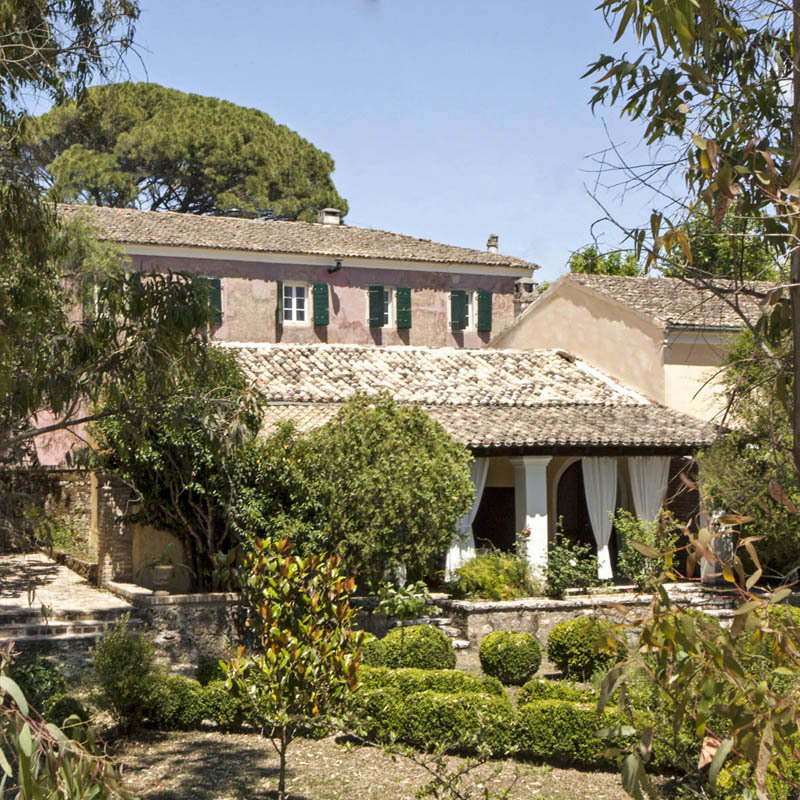 It was used, in the past, for olive and wine production, until owner Nikos Velianitis turned it into a hotel. 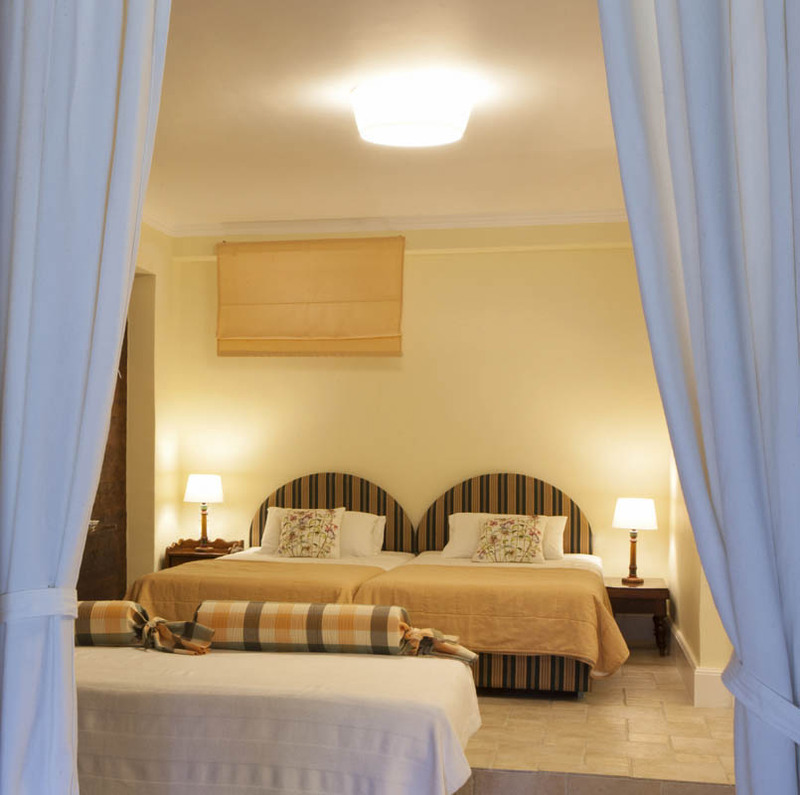 It is a great place to stay if you want to experience the rural and tourist-free side of the island, while having the sea just a short drive away. 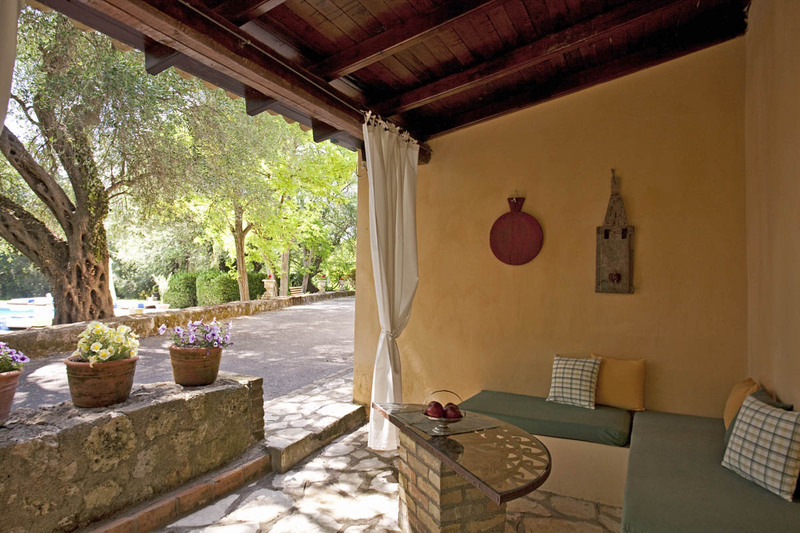 Nikos and his daughter Alexandra want their guests to experience a country lifestyle of times past while at the same time enjoying contemporary luxury during their holidays. 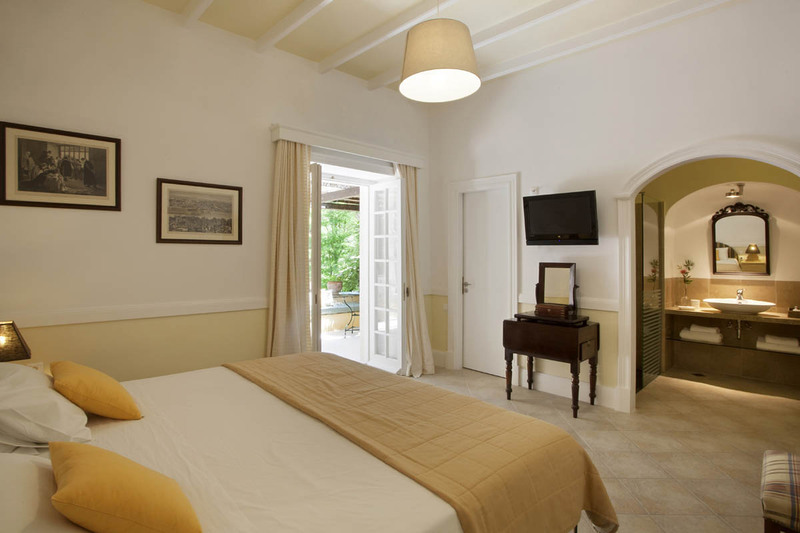 Spacious studios and suites are located in the buildings where the stables and the olive press used to be. 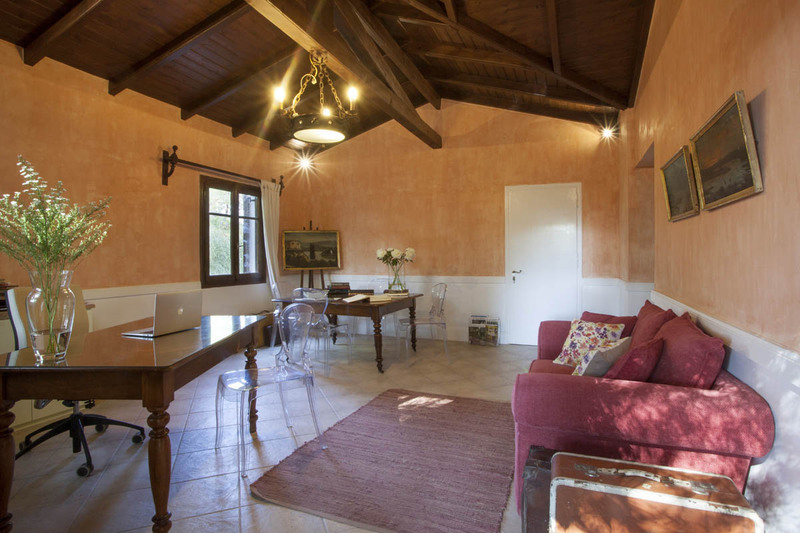 They are furnished with family antiques and tastefully adorned with big candles, dried flowers and baskets with books and magazines – bathrooms and kitchenettes have recently been renovated. 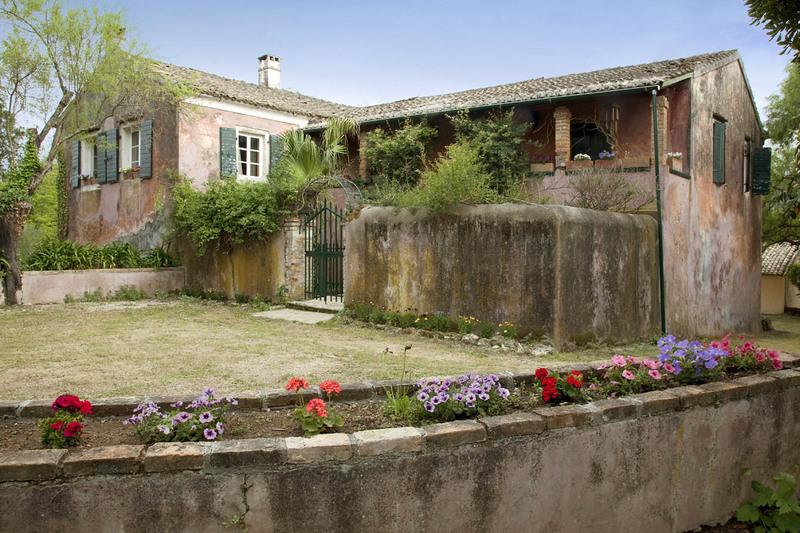 The Casa Padronale (three bedrooms, a sitting/dining room, an office and a private garden) occupies the first floor of the mansion where the family used to live. The Pelecas Country Club is a hotel where you could simply enjoy the peace and quiet, go for walks and do some horseback riding, but you can also play a game of tennis and tan on one of the teak sun-beds next to the fabulous swimming pool while sipping cocktails. 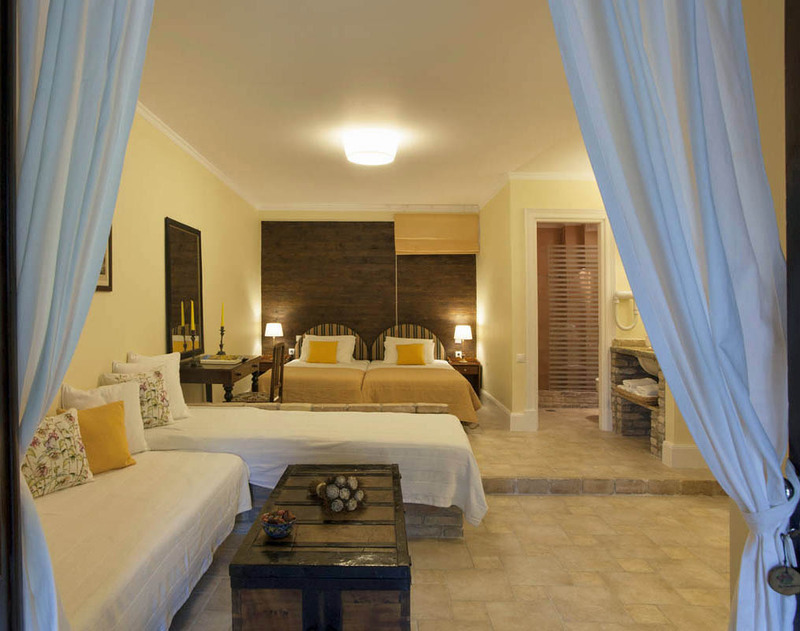 There’s a feeling of unpolished luxury; the atmosphere is relaxed and laid-back, friendly and uncomplicated. 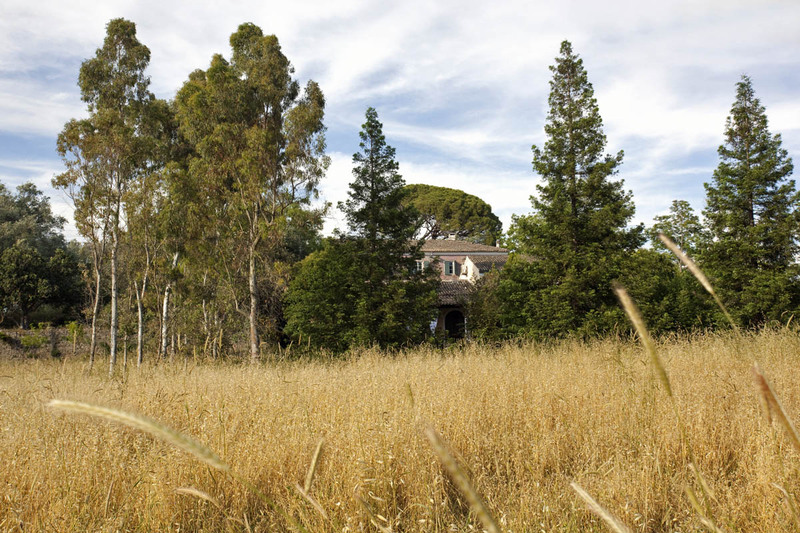 I love the atmosphere at this family estate. 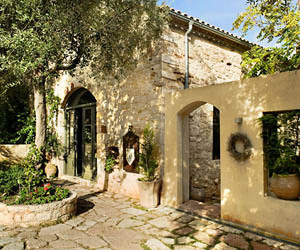 It is stylish; the gardens are beautiful and the swimming pool is very inviting. Brunch is straight from heaven. To go to the beach or to eat out, you definitely need a car when you stay at the Pelecas Country Club. The nearest beach is about ten minutes by car; restaurants in the village of Pelekas are a little closer. Allowed with prior agreement. Horses are welcome too! 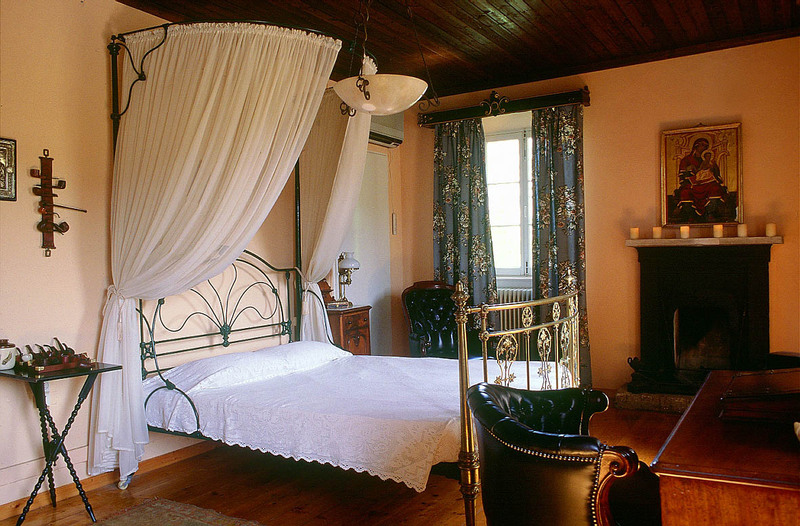 Prices for two persons from 125 Euro per night, breakfast and taxes included. 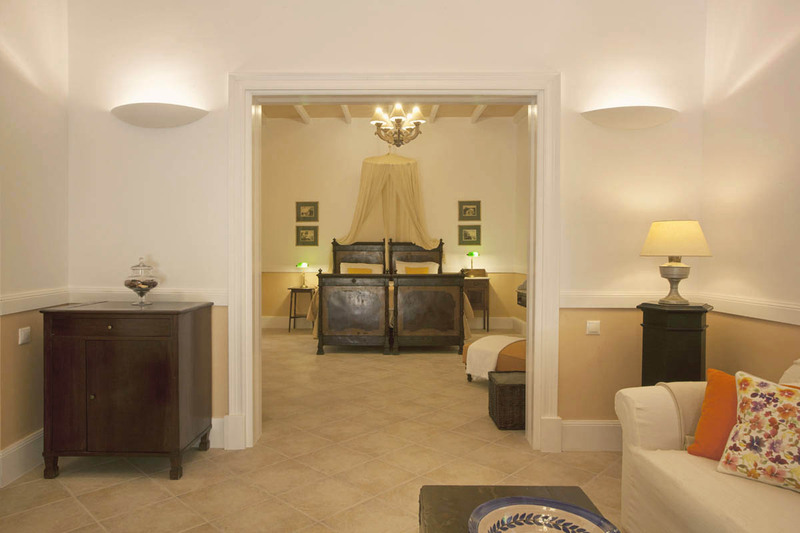 For a full overview of room rates, please contact the Pelecas Country Club. There’s no breakfast at the Pelecas Country Club; they do a lavish brunch instead. It is served until 12.30 pm in the bar by the pool or in the old mansion. After a spread of omelettes, sausages, savoury pies, salads, crêpes, yogurt, fresh fruits, cakes and sweets, you will probably to skip lunch. 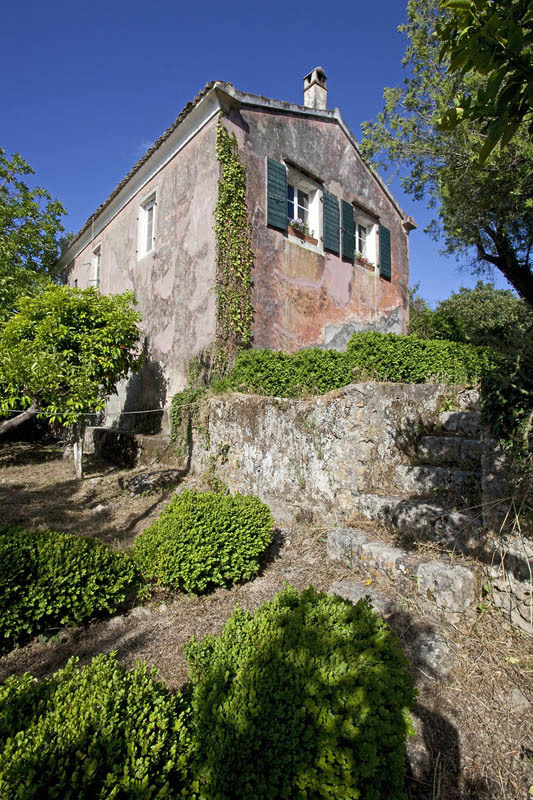 You can also cook something simple in your kitchenette, otherwise, for dinner you will have to drive a few kilometres to the village Pelekas or to the town of Corfu. There’s a decent choice of Greek restaurants and tavernas in Pelekas (as well as some pizza places), while in town you are spoiled for choice (Greek, Italian, Mediterranean…) If you have the opportunity, spoil yourself one evening with a dinner at Etrusco, supposedly Greece’s best restaurant, serving imaginative gastronomic cuisine. It is bit further north, in Kato Korakiana. Though the Pelecas Country Club is perhaps not a typical hotel for family holidays, your little ones are more than welcome and I think no matter what their age is, they will love it. 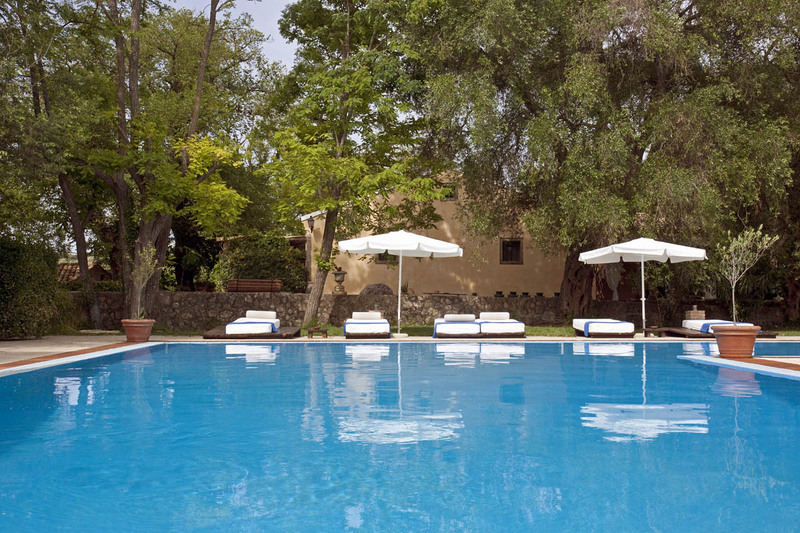 The pool, the tennis court, the animals, the large gardens… it’s paradise! Of course, if your children are in the running around age group, you should keep in mind that guests without children would appreciate a bit of peace and quiet. Also, because of the pool, you’ll need to keep a watchful eye if you have young children who do walk about, but do not know how to swim yet. 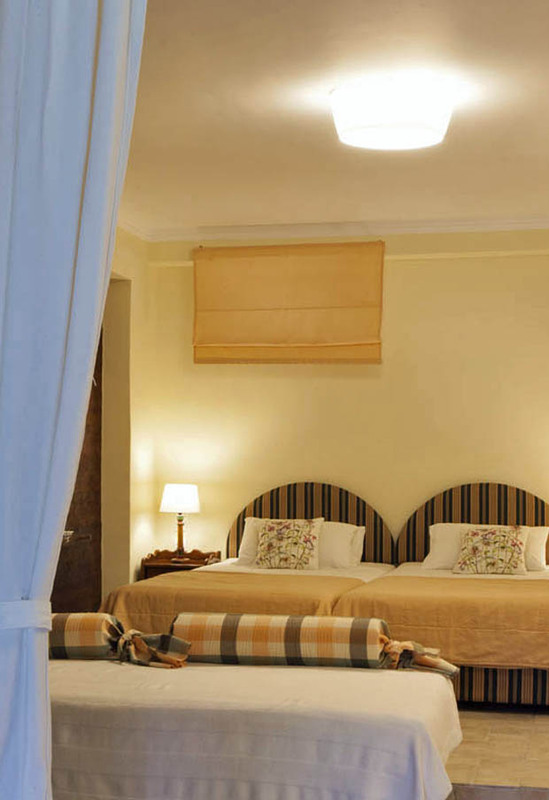 The suites (which are in fact more like apartments) are spacious and very convenient for families. 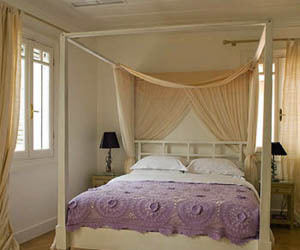 Cots/cribs are available if you travel with a baby and babysitting can be arranged. 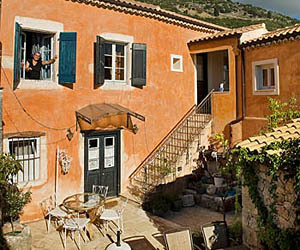 Corfu in general is a great destination for family holidays. There are good child-friendly beaches (the one of Pelekas with nice sand, shallow waters and umbrellas is particularly great for young children) and there is plenty of entertainment kids will enjoy (water parks, boat rental, water sports…). 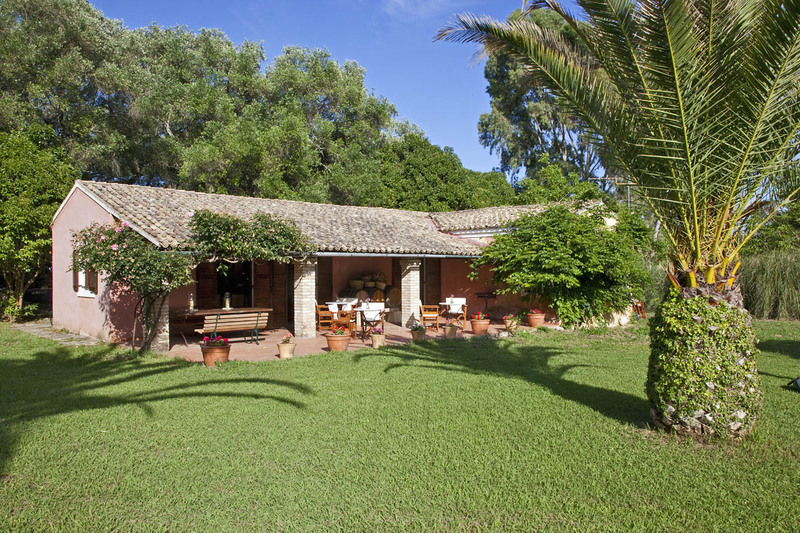 A few minutes from the Pelecas Country Club, the Silvaland Equestrian Centre offers lessons for children from the age of two, pony mornings for kids between the age of five and eight, and full day activity programmes for kids up to twelve years old. Young children will definitely enjoy a visit to the Corfu Donkey Rescue sanctuary near Palaiokastritsa. The beaches along the west coast of Corfu are beautiful and varied. Some are sandy; others have pebbles. 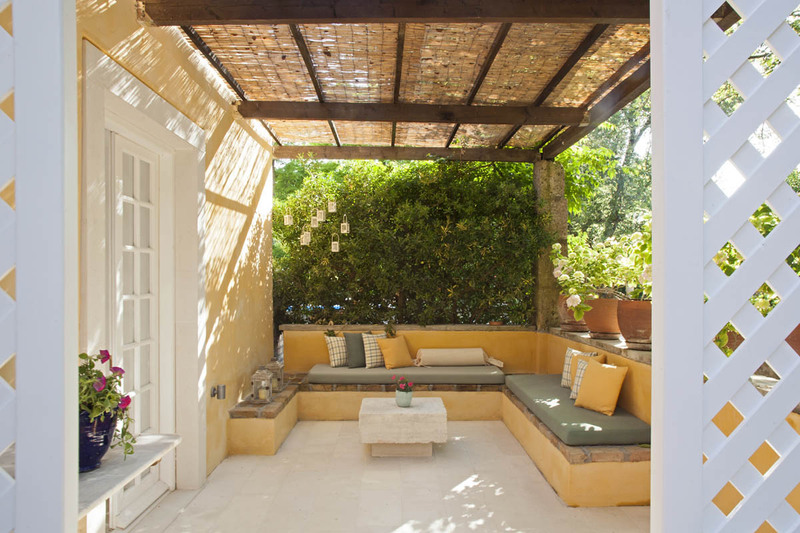 Some are large, easy to reach and have loungers and parasols on offer. These get crowded. Others are small, hidden, gorgeous and much quieter, but some of these can only be reached by sea. There are some amazing beaches at Palaiokastritsa, less than half an hour by car. Rent a little motorboat (no licence required) to take you to those that cannot be reached by land. There are also two scuba diving centres at Palaiokastritsa. The Corfu Trail (a 220 km marked walking route running from the very south of the island all the way to its northernmost tip) passes by Pelekas. So bring your hiking shoes and go walking, maybe not the full 220 km, but you could do the one-day walk to Liapades, or in the opposite direction to Benitses, and treat yourself to a taxi back. There’s an excellent riding school only a few minutes away from Pelecas Country Club, with lessons for children (from the age of two! ), beginners and experienced riders, and there’s therapeutic riding as well. Other riding clubs on the island offer horseback riding tours. Ask Alexandra for advice. 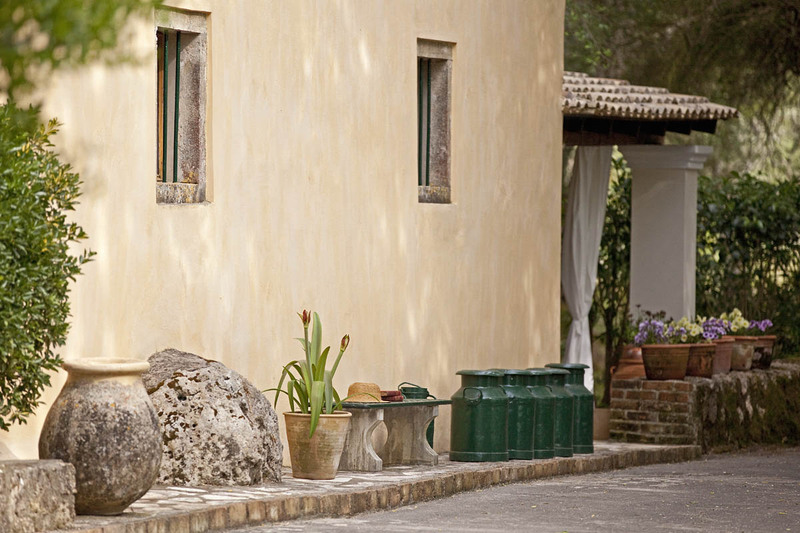 Play a round of golf at the Corfu Golf Club, ten minutes by car . You will enjoy the scenery of this beautiful 18-hole course set in the Ropa Valley. You can rent equipment, and teachers are available too. 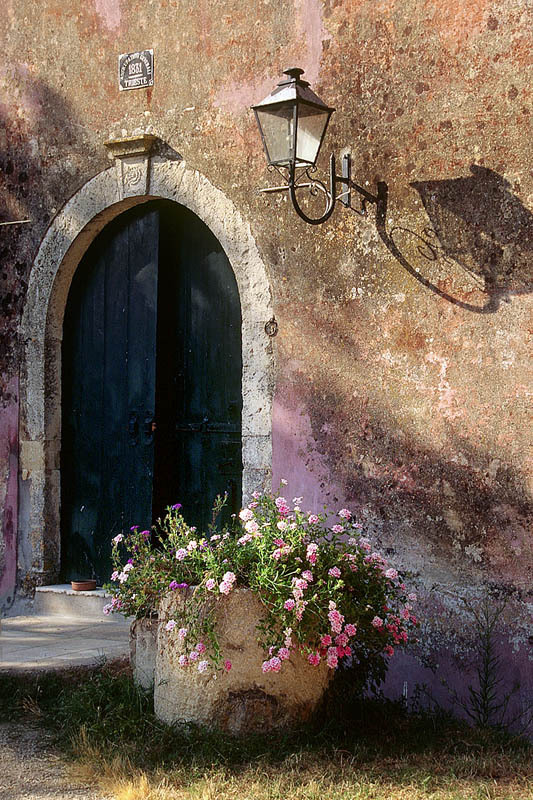 Spend a few hours (or more) in the Corfu Town. Stroll around in the old town for a bit of shopping, and admire the Venetian architecture. 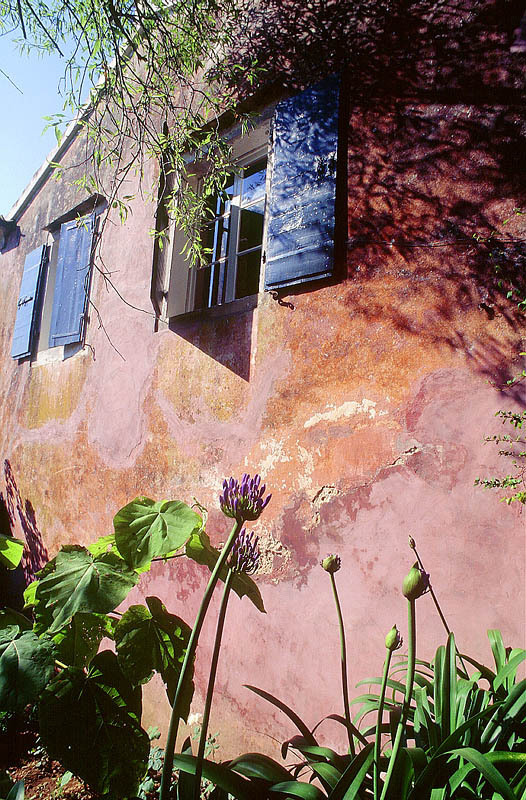 Visit the Casa Parlante Museum to get a glimpse of the daily life of a typical aristocratic family in the 19th century. Walk around the peninsula with the 15th century Old Fortress and walk up to the 16th century New Fortress above the old port. Enough going around already. You could also not go anywhere. 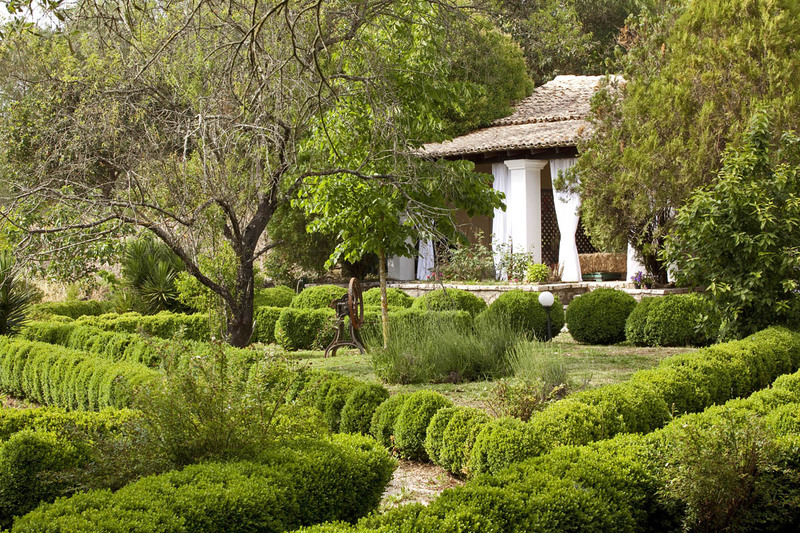 Just swim in the pool, walk around the gardens, play tennis and say hello to the horses. 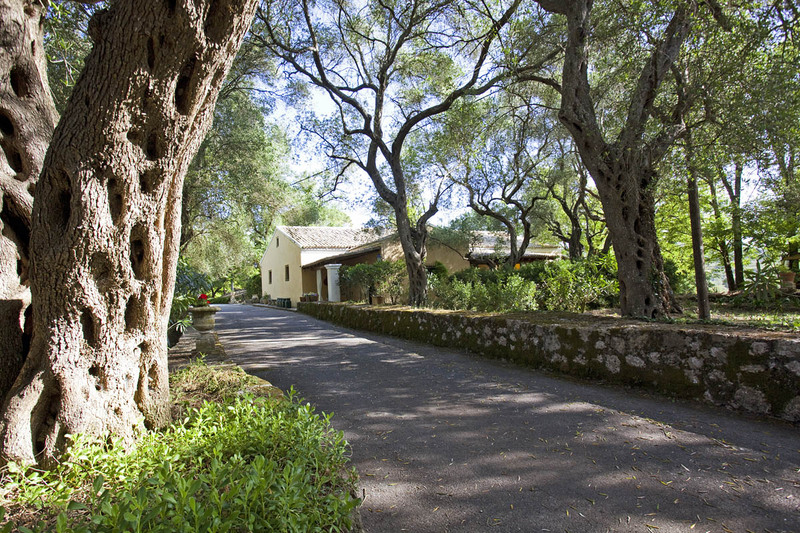 The Pelecas Country Club enjoys a peaceful setting in the countryside of the island of Corfu, in the midst of an olive tree estate. The nearest village (Pelekas) is 3 km away, and there’s a beach at 3 km. The island’s capital is at 9 km. There are several daily flights from Athens to Corfu. If you come from abroad, you may also find a direct flight. If you come by car, you will cross from Igoumenitsa (there are several ferries a day and the crossing takes about one hour). To get to the Pelecas Country Club, you should follow signs for Paleokastritsa and Pelekas from the town of Corfu. 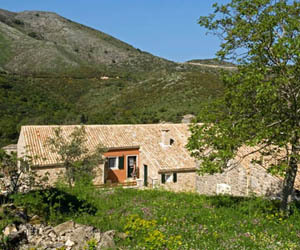 About seven kilometres from the town, you turn left towards the village Pelekas. The entrance to the Pelecas Country Club is on your right, about two kilometres after this turn. Last time I went, the sign had disappeared, so the best I can tell you is to look out for two red brick pillars and an iron entry gate, and to have your mobile phone and the phone number of the hotel at hand. If, by the way, you don’t want your arrival to go unnoticed, keep in mind there is a helicopter pad as well! Our wedding co-ordinator actually went the day before and found the hotel for us, without her detailed directions it would have taken us much longer to find the place. However the lack of a sign on the gates is by design – as the bar man/ receptionist told us that this kept out unwanted visitors. 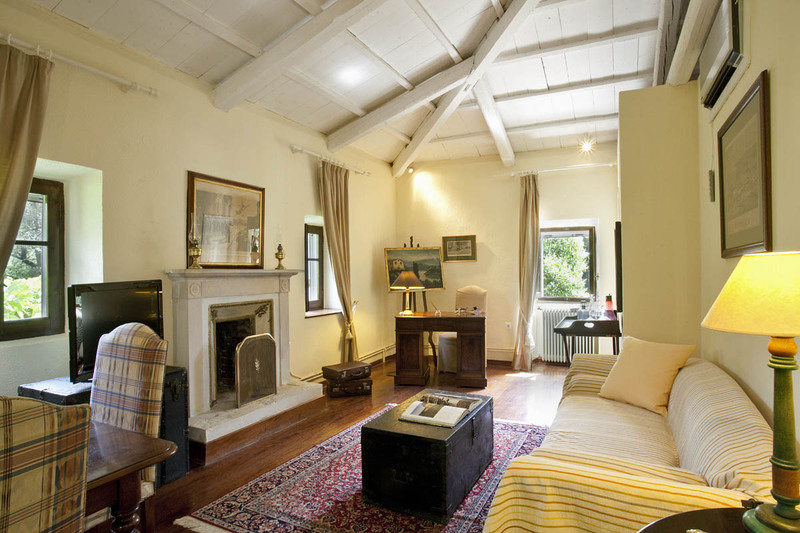 The apartment was excellent and adorned with antiques and books about Corfu architecture. Because it was our wedding night there was a complimentary bottle of sparkling wine and rose petals on the bed – a nice touch. 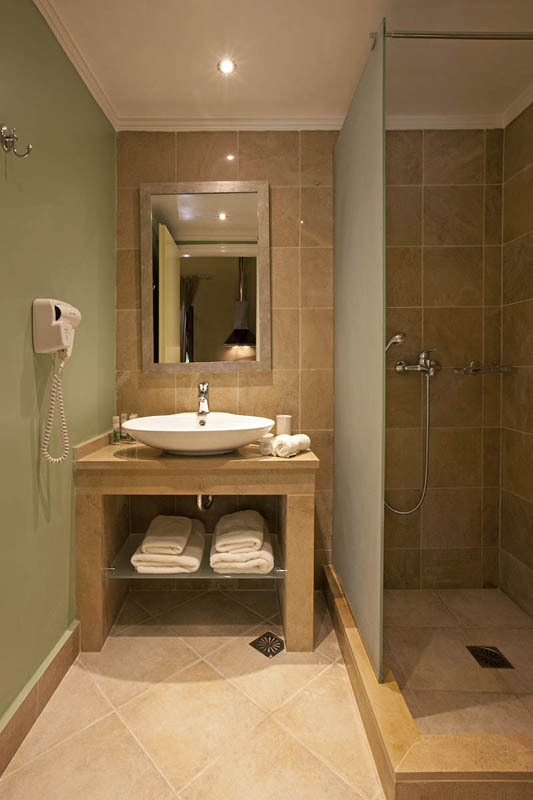 The facilities were as expected – satellite tv and phone, separate toilet and shower. The toiletries were excellent. The brunch in the main dining room (excellent surroundings) was good. Definitely a place to stay for special occasions. 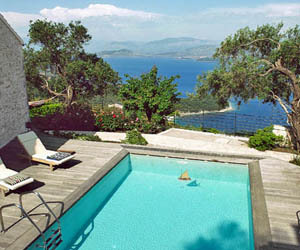 A private villa for only one couple on the hillside on the northeast coast of Corfu. 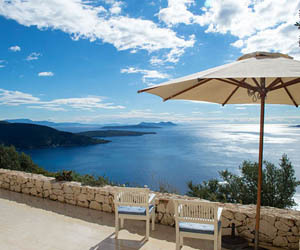 Great luxury, total quiet, amazing views and a swimming pool. 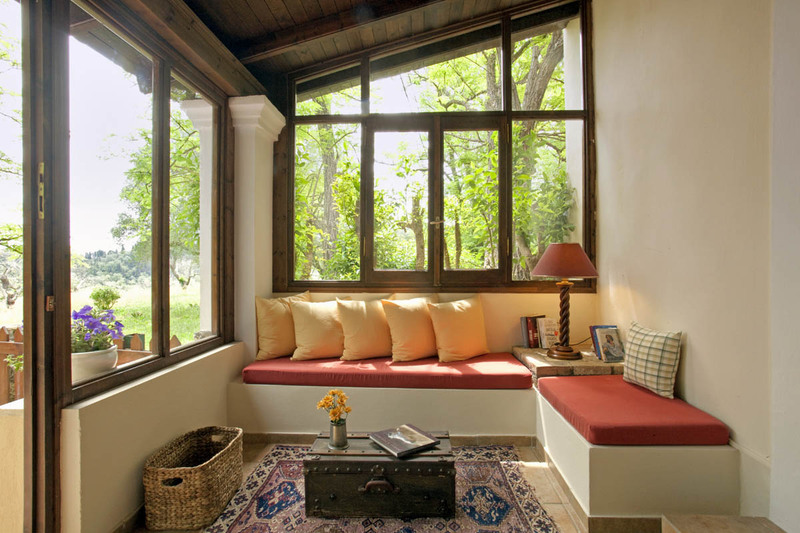 A romantic escape that has honeymoon written all over it! 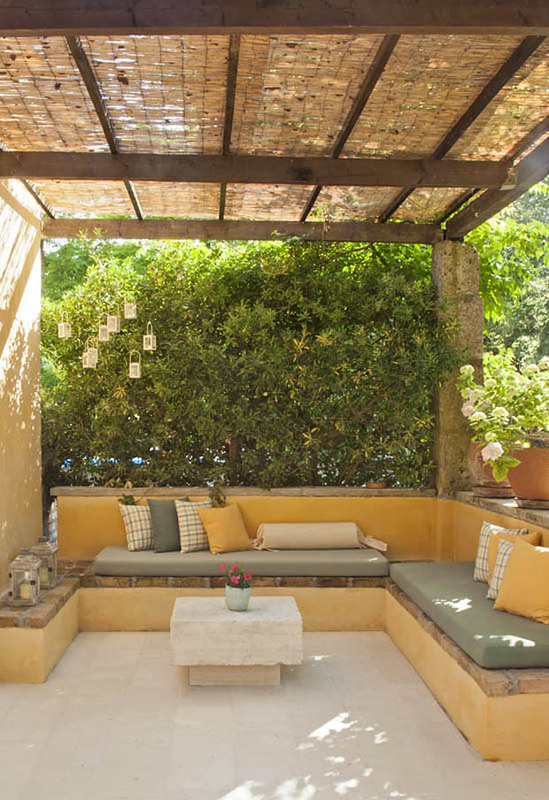 A charming place to stay in the capital of Lefkada Island: a 200-year-old town house converted into a romantic little hotel with stylish rooms & suites; an inviting courtyard garden and a good breakfast. 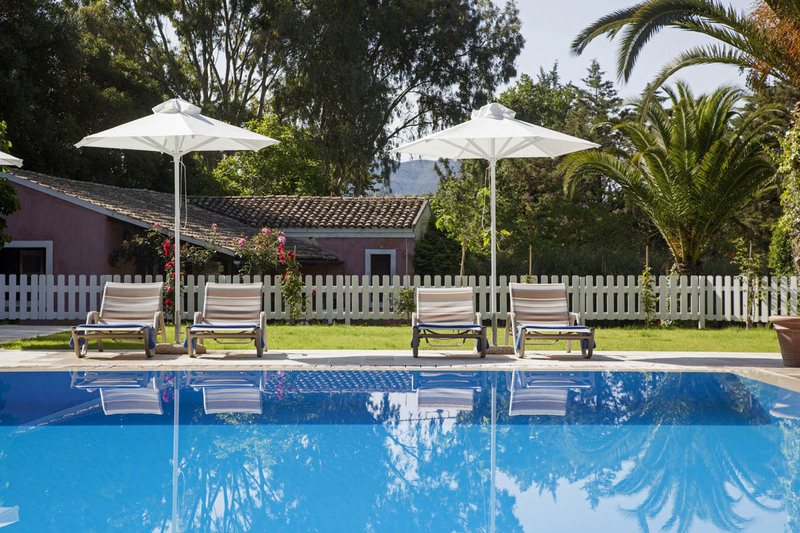 A wonderful country-stylish holiday retreat on the island of Lefkada, where you will find a combination of luxury and tradition, private pools, excellent food, total peace and quiet and a small spa. 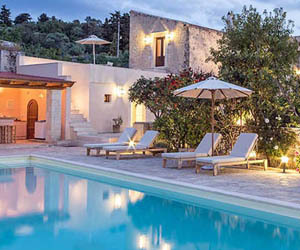 A 19th century olive press converted into a gem of a boutique hotel in Ithaca, one of Greece’s most beautiful islands. 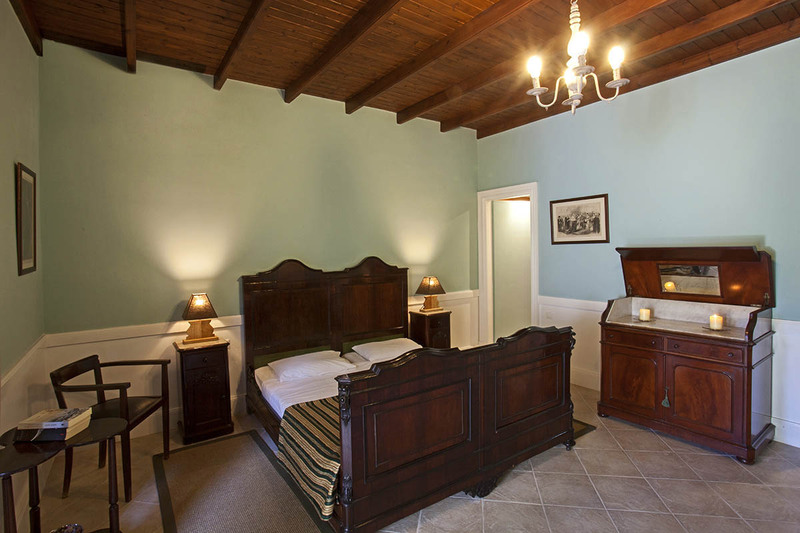 A striking blend of old and new; a very comfortable and welcoming place to stay. 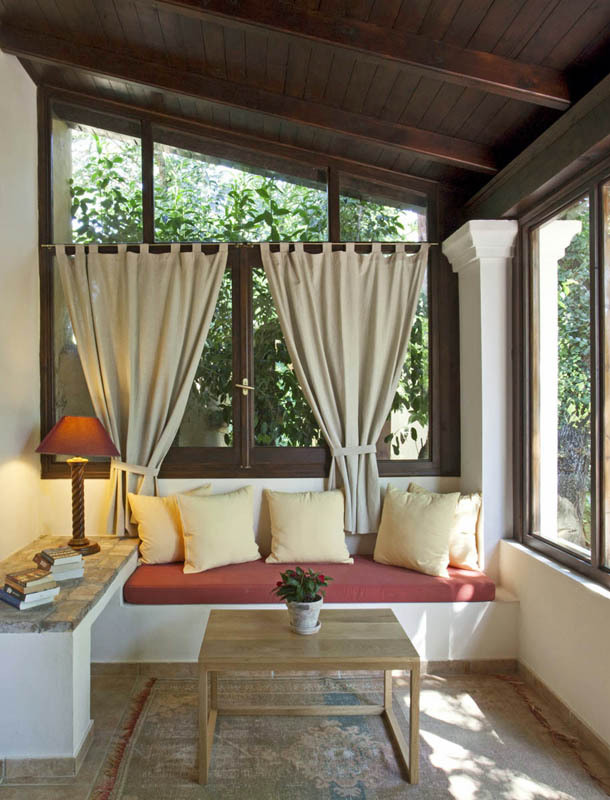 A charming 19th century family house in a small village in the hills of Kefalonia turned into an adorable little hotel. 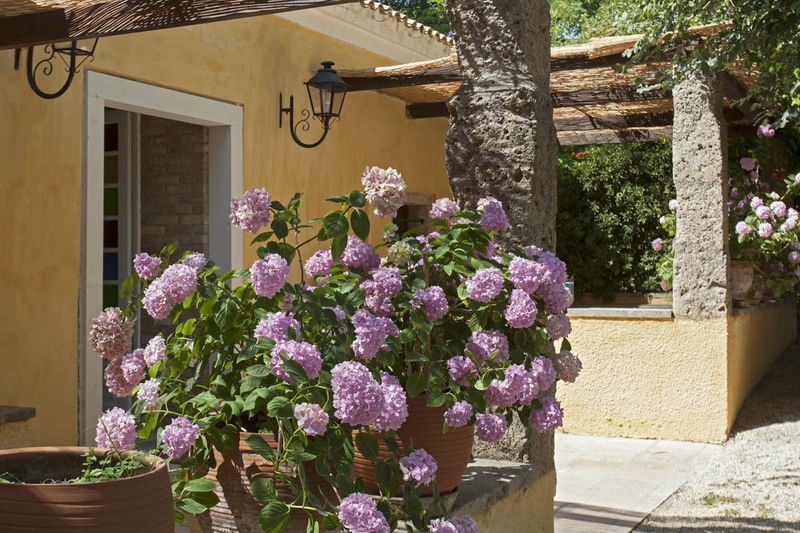 Romantic bedrooms and delicious meals served in a flower-filled courtyard.